This Monday coming marks the 800th anniversary of Magna Carta, a peace treaty between a comically cowardly drunken king and his leading barons. It mainly focused on financial disputes but it nonetheless came to become ‘the Bible of the English Constitution’, in William Pitt the Elder put it. Although there is some understandable scepticism about the way that Magna Carta was romanticized by 17th century opponents of the Stuart monarchs, and the motives of the barons were almost entirely selfish, its four surviving clauses (sometimes counted as 3, as 39 and 40 were merged into one in the definitive 1297 reissue) still hold enormous weight, legally, culturally and emotionally. But though Clause 39 – “No free man is to be arrested, or imprisoned, or disseised, or outlawed, or exiled, or in any other way ruined, nor will we go against him or send against him, except by the lawful judgment of his peers or by the law of the land” – is well-known to educated people, it is less commonly recalled that Clause 1 states “that the English Church is to be free, and to have its full rights and its liberties intact”. 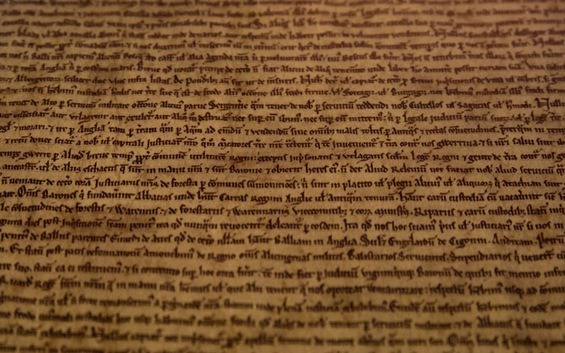 More importantly, the Christian origins and influence of the Great Charter are mostly ignored, a point raised in a new Theos report by Thomas Andrew, The Church and the Charter: Christianity and the Forgotten Roots of Magna Carta. In particular Andrew addresses the unsung hero of Magna Carta, Archbishop of Canterbury Stephen Langton, who played a huge part in drawing up the treaty and implementing it. Archbishop Langton was perhaps intellectually the most important figure behind Magna Carta, and although he may have not have written it (no one knows exactly who, although it was certainly a collaboration), according to one chronicler he played a big part in suggesting the idea by raising the subject of Henry I’s 1100 coronation charter, a series of promises made by the Norman king which influenced the men of 1215. “A more nuanced position recognises that the ideas contained within the Magna Carta are part of a developing intellectual tradition. They did not emerge ex nihilo, but arose as an expression of pre-existing thought, given shape and substance in the political demands of the moment. And a key aspect of that intellectual tradition is the contribution of the Christian Church and Christian theology. The booklet also contains a foreword by Larry Siedentop, the author of Inventing the Individual: The Origins of Western Liberalism, which is an essential study of how individualism and freedom have their roots in St Paul. I would say that everyone should be forced to read this book, but I suppose that would go against the whole point of it. As Siedentrop points out: “The understanding of justice itself began to be more closely associated with the assumption of moral equality. For a strong case can be made that the earliest form of natural rights theory was the work of canon lawyers from the 12th to the 14th century – lawyers who transformed the idea of natural law inherited from the ancient world, by giving it a far more individualist cast. In their hands, ‘aristocratic’ liberty, liberty understood as personal and corporate privileges, began to give way to a more ‘democratic’ conception of liberty. Of course this is not an isolated incident; the eradication of the Church’s influence on Magna Carta is part of a wider cultural amnesia in which the Christian origins of so many ideas we now assume to be universal have been forgotten. In that sense Christianity has rather been a victim of its own success. Ed West is the deputy editor of the Catholic Herald and author of The Silence of Our Friends: The Extinction of Christianity in the Middle East.